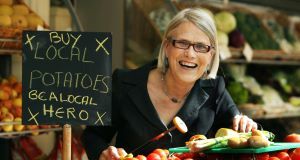 Darina Allen is the owner of Ballymaloe Cookery School in Shanagarry, County Cork, Ireland. In addition to being a teacher, food writer, newspaper columnist, cookbook author and television presenter she is a leader in Ireland’s Slow Food movement. Allen is a founder of the first Farmers Markets in Ireland, and her school is run on an organic farm.